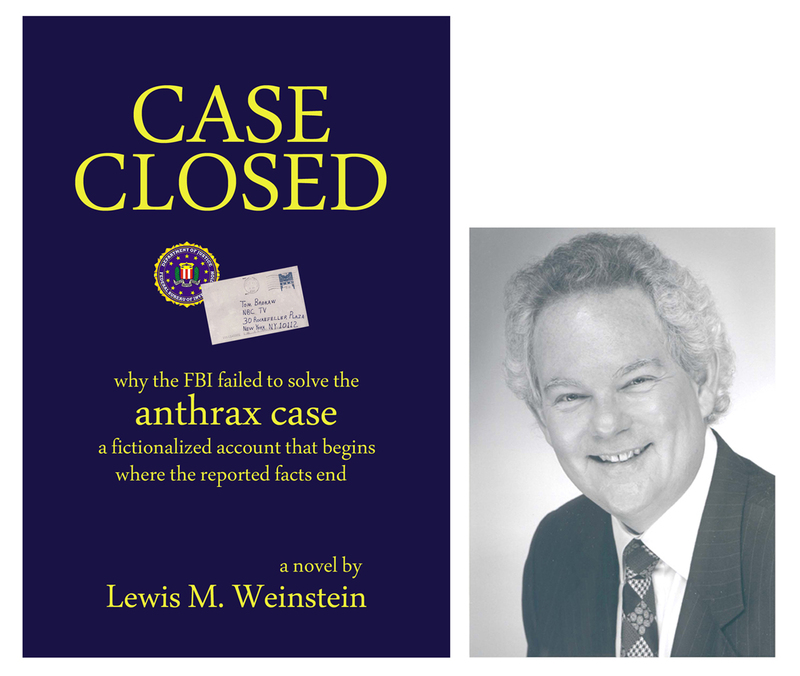 2011 May « CASE CLOSED … what really happened in the 2001 anthrax attacks? Dr. Saathoff was definitely a stakeholder and not independent. He was an active part of the investigation of Dr. Ivins. He was the FBI’s expert. All I see is a theory that has strong parallels to a Hatfill Theory accompanied by dramatic withholding of documents and mischaracterization or misunderstanding of the documents. Respectfully, Special Agent Lawrence Alexander and his colleagues should ask that the DOJ FOIA office produce the nonsealed documents in the Stevens litigation. 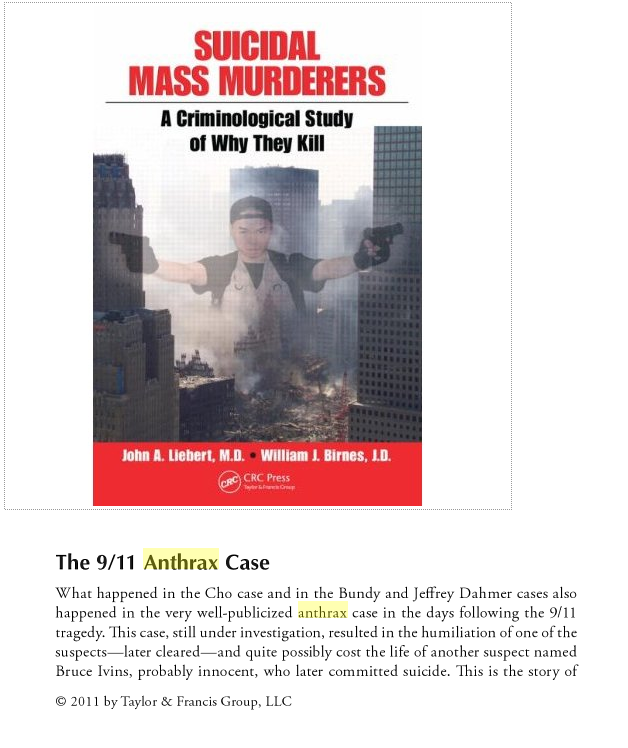 Lawrence Alexander and AUSA Rachel Lieber should have DOJ produce the September 17, 2001 email from Bruce Ivins to Mara Linscott dated September 17, 2001. Rachel claimed it had been written from Dr. Ivins work computer. But USAMRC FOIA people emphatically dispute that after careful double-checking. I see an awful lot of disclosure about whether Dr. Ivins blindfolded Teddy Bears when he was 6 but so far have overlooked any disclosure that the FBI falsely told Dr. Ivins that Dr. Heine had fingered him. They had told him that they were going to call his vulnerable daughter before the grand jury. They insisted to Amanda that Dr. Ivins was a murderer. Dr. Ivins fiercely loved his daughter and son and was very protective of Amanda given her previous suicide attempt. I see an awful lot of effort to claim that Dr. Ivins made a dried powder on those specific dates — and at the same time AUSA Rachel Lieber refused my written request to produce the lab notebook pages written on those nights. who is responsible for any continued withholding. The FBI took the only copy from USAMRIID and so USAMRIID cannot produce them. 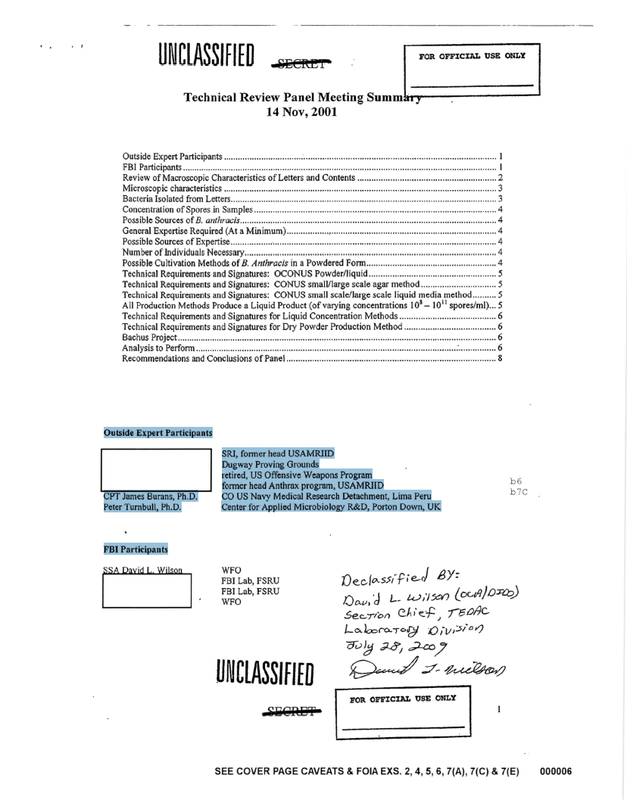 The DOJ investigators and prosecutors should back full production under FOIA of Dr. Ivins lab notebooks for the relevant period — 1998 – 2001, as well as production of a copy of the 9/17/2001 email to Mara Linscott. My novel CASE CLOSED is of course fiction, written in 2008 before this blog started. However, the more I’ve learned since I wrote the book, much of it through contributors to this blog, the more convinced I am that the questions I raised in my story and the scenario I suggested are very much on the trail of the truth. Many readers, including one highly placed member of the U.S. Intelligence Community, have called CASE CLOSED “prescient” and “frightening” because it is very likely to contain elements of whatever did actually happen. The FBI ignored as potentially erroneous a measurement of silicon in one anthrax sample and then hid this information from Congressman Jerrold Nadler (D-NY). Even more importantly, the high silicon measurements in at least two samples also were coupled with high tin measurements, opening up the possibility that silicon was added to the attack material in a form that is not mentioned in any of the FBI documents. Significantly, it is virtually impossible that Bruce Ivins, whom the FBI has concluded acted on his own to carry out the attacks, would have been able to perform the necessary chemical manipulations involved in this treatment of the spores. Ivins likely also would not have had access to the necessary laboratory equipment to perform this treatment. 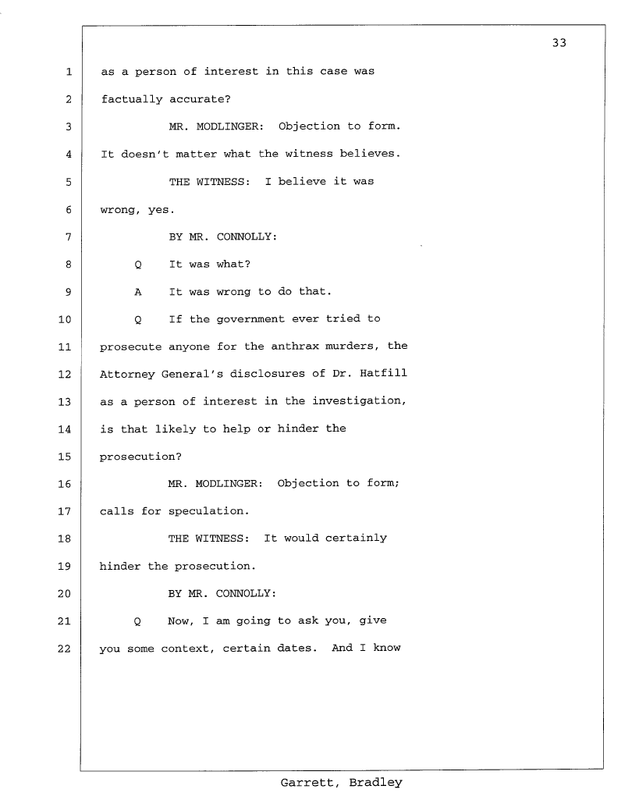 Nadler specifically asked Mueller why the FBI appears to have provided incorrect information on the case to Nadler and the Judiciary Committee subsequent to a September 16, 2008 oversight hearing on the FBI. * Greg Gordon (McClatchy): the apparent failure of the FBI to pursue this avenue of investigation raises the ominous possibility that the killer is still on the loose … Stuart Jacobsen: it is “outrageous” that the scientific issues haven’t been addressed. * RMR-1029 was registered as #7737 in Building 1412 ; what were particulars of #7736? Was it from same seed stock? Did it have a silicon signature? 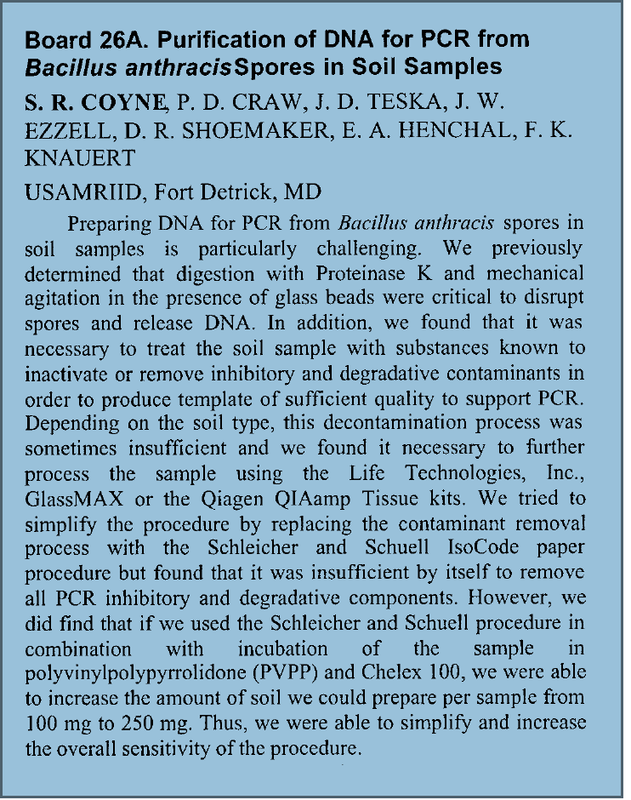 * Did the anthrax grown in soil reported at the June 2001 anthrax conference by Dr. Ezzell and his colleagues contain a Silicon Signature? * Silicon Signature – what were samples 040030-2 and 040255-1 that showed Silicon Signature? If one was Flask 1030, what was the other? Dugway? to what was a very simple factual question !!! FBI Laboratory results indicated that the spore powder on the Leahy letter contained 14,470 ppm of silicon (1.4%). The spore powder on the New York Post letter was found to have silicon present in the sample; however, due to the limited amount of material, a reliable quantitative measurement was not possible. 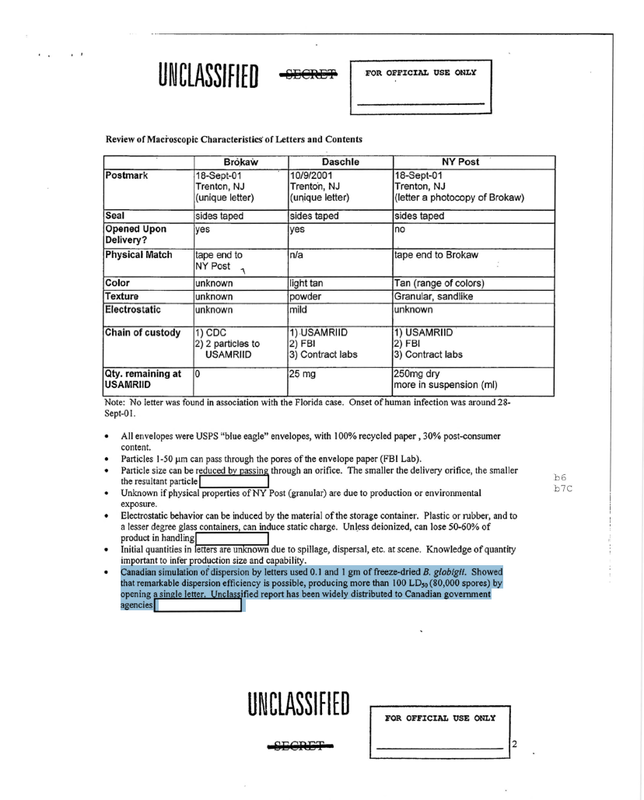 Insufficient quantifies of spore powder on both the Daschle and Brokaw letters precluded analysis of those samples. A February 15, 2011 report by the National Academy of Sciences (“NAS report”) … raises three questions about this DOJ/FBI response to me. First, with respect to the anthrax on the letter sent to Senator Leahy, the NAS report shows on pages 66 and 67 (Table 4.4) that the silicon content found by the FBI was 1.4% in one sample and 1.8% in a second sample. in response to my questions? 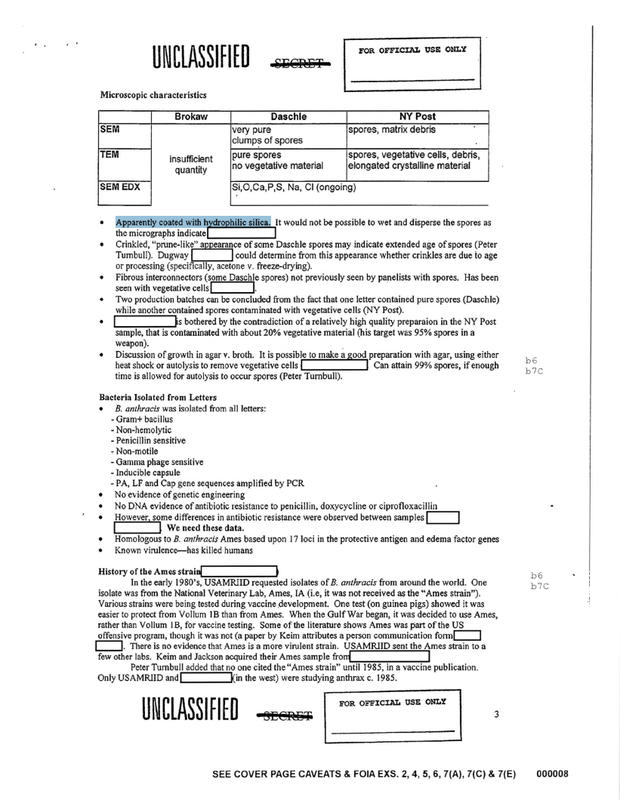 Second, the NAS report shows on pages 66 and 67 (Table 4.4) that the FBI found the silicon content in the New York Post letter anthrax to be 10% when the bulk material was measured by mass and 1-2% when individual spore coats were measured by mass per spore. Third and finally, the NAS report raises questions about the appropriateness of the measurements taken of the anthrax on the letter to the New York Post. (the NAS said) … additional samples should have been analyzed to determine representativeness. If such data exist, they were not provided to the committee. Lacking this information, one cannot rule out the intentional addition of a silicon-based substance to the New York Post letter, in a failed attempt to enhance dispersion. The committee notes that powders with dispersion characteristics similar to the letter material could be produced without the addition of a dispersant. of the New York Post letter material? If the FBI did do these additional tests, please provide the resulting data to me and NAS. 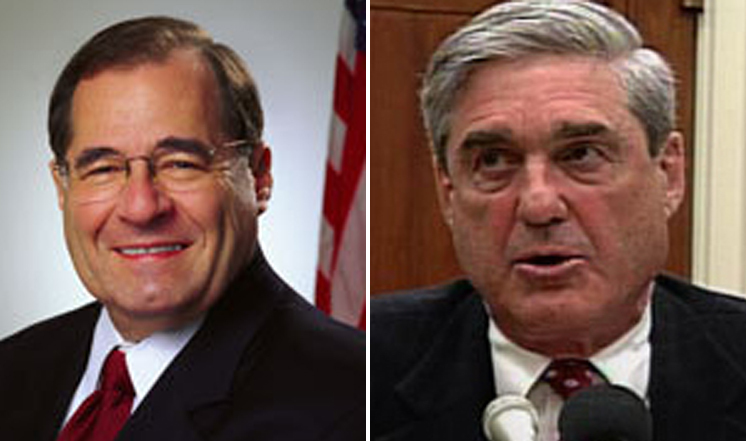 It seems clear from Congressman Nadler’s letter that FBI Director Mueller has been less than forthcoming to the House Judiciary Committee on crucial issues regarding the investigation of the 2001 anthrax attacks. The Congress and the American people need to know the truth and also why Director Mueller has avoided fully stating that truth. …. science that proves innocence instead of guilt. So what really happened? And why doesn’t the FBI offer America a credible story? * PROMED post by Dr. Martin Hugh-Jones, an oft-quoted and much respected anthrax expert and PROMED moderator. This [recent McClatchy] report is parallel to the evidence we — Barbara Rosenberg, Stuart Jacobsen, and myself — submitted to the NAS (National Academy of Sciences) committee last summer (2010). A fuller version is in the final stages of preparation for submission to a suitable journal. If the latter had had the wit to follow up on it at that time all this would be history and the true perpetrator(s) suitably dealt with. 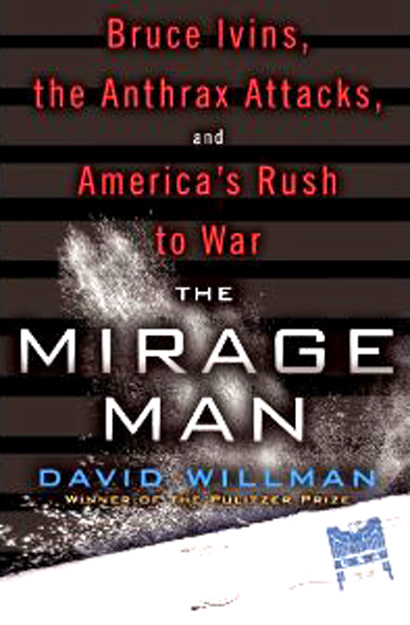 Also tracking past sales of silane and siloxane chemicals to institutes and agencies handling Bacillus anthracis would have produced a short list for immediate visits and interviews by FBI agents with search warrants, and then the names of who would have had access to the products of their polymerization research. Dr. Hugh-Jones is one of the foremost authorities on anthrax. 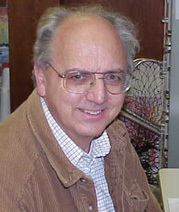 He is currently Coordinator of the World Health Organization (WHO) Working Group on Anthrax Research and Control. 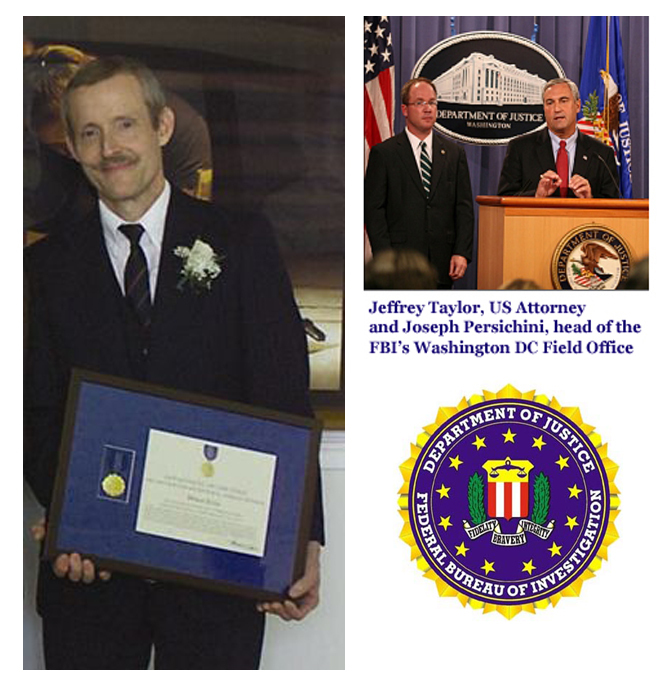 He also has served as Chairman of the WHO/Veterinary Public Health Working Group: “Anthrax: Epidemiology and Information.” In addition, Dr. Hugh-Jones participated in the investigation of the 1979 anthrax outbreak in Sverdlovsk (now known as Yekaterinburg) in the former USSR. He was in Moscow and Yekaterinburg in 1992 when the Russian government admitted the source of the outbreak to have been an accidental spore emission from a biological warfare facility. * Another arrogant government assertion of its right to do whatever it damn well pleases, not unlike the FBI’s unsupported accusations and subsequent stonewalling behavior in the anthrax case. National security is very important, but so are the rights of American citizens, including David House and Bruce Ivins. Freedom of association is so vital to our democracy that the framers put it in the First Amendment, alongside freedoms of speech, press, religion, and petition. Defending that right for all Americans is why the ACLU today is filing a lawsuit in federal court in Boston on behalf of a 24-year-old computer programmer and Cambridge activist named David House. 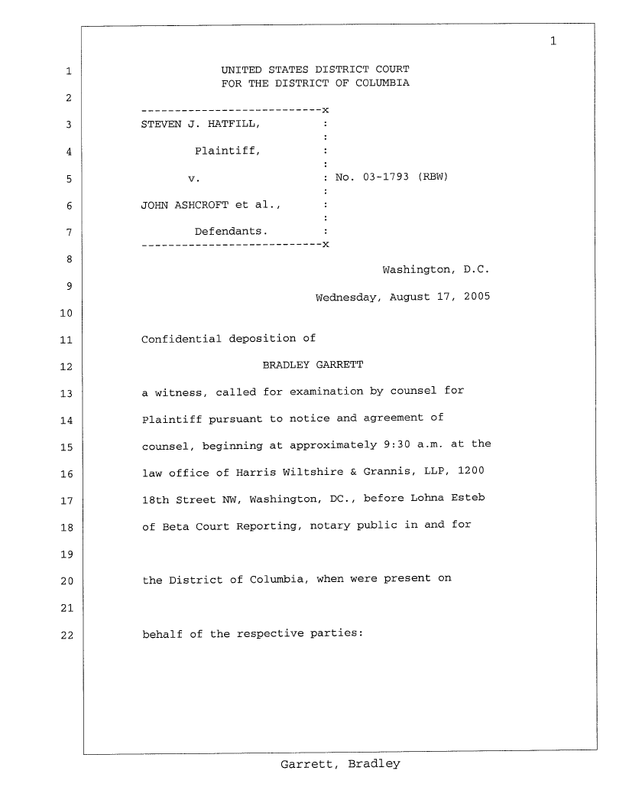 The case challenges the government’s targeting and suspicionless search and seizure at the border of David’s computer and camera, which occurred as a result of his association with the Bradley Manning Support Network. Initially, the ACLU sent a letter to government agencies demanding the return of David’s equipment and requesting that any copies of David’s personal information be deleted. Immediately after the ACLU sent the letter, the government shipped David’s hardware back to him. They did not address David’s request that the government delete all copies of his data and clarify whether Homeland Security had shared his data with other agencies. Another arrogant government assertion of its right to do whatever it damn well pleases, not unlike the FBI’s unsupported accusations and subsequent stonewalling behavior in the anthrax case. National security is very important, but so are the rights of American citizens, including David House and Bruce Ivins. * Former Amerithrax investigator Bradley Garrett, who took the lead on the Hatfill searches, rode on the plane with KSM’s nephew, WTC bomber Ramzi Yousef, upon his rendering to the US. How did Agent Garrett exclude the subtilis expert living 20 miles from the mailbox who frequently called and was called by the number associated with Abdul Yasin and Ramzi Yousef in February 1993? On the mistaken grounds that Dr. Ayman Zawahiri did not have access to virulent anthrax?